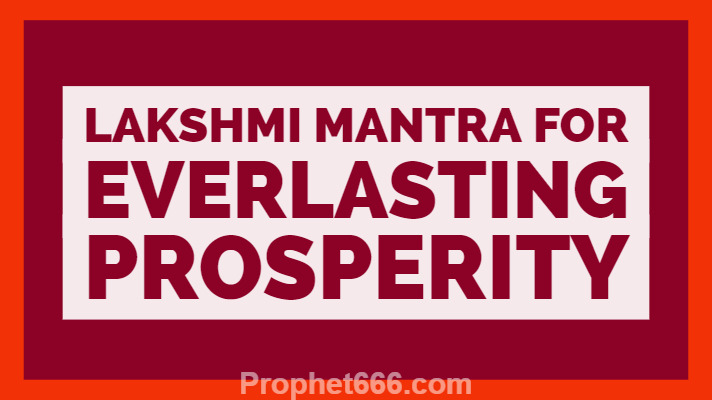 The Lakshmi Mantra for Everlasting Prosperity described in this post is extremely useful in attracting wealth and abundance and harmony and peace in your lives. 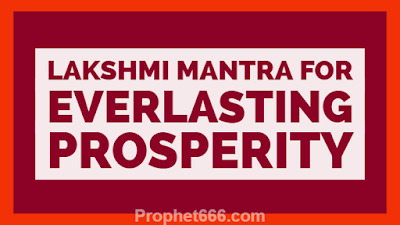 The Lakshmi Mantra Sadhana can be practiced by everyone, including business persons and housewives for appeasing the Goddess of Plenty and getting her everlasting blessings. The Lakshmi Mantra used for this Sadhana is small but most powerful and potent and can generate extremly positive vibrations. The simple procedure given below should be followed, if you wish to practice this Lakshmi Mantra Sadhana. 1] Start the Mantra Sadhana on a Friday because it is the most beneficial day of the week to start any kind of Sadhana related to Lakshmi Mata. 2] Take a Sankalp before starting this Lakshmi Mantra Sadhana that you will practice this Mantra Sadhana for 49 days by chanting the Mantra 1008 times daily and then chant it 108 times daily. 3] Sit down comfortably before an idol or photograph of Lakshmi Mata and light Dhoop and Diya and offer some sweet item, like sugar as Prasad and then start the Mantra Chanting. Notes- Kamal Gatta Japa Mala or a Counting Rosary prepared using Lotus Seeds is considered to be the best kind of Mala for Lakshmi Mantras. A Sphatik or Crystal Beads Counting Rosary can also be be used for this Mantra Sadhana. Disha and Aasan or Direction and Siting Mat are not prescribed for this Mantra Sadhana. However a Yellow Colored Aasan is preferable. The Mantra Sadhana can be performed either in the morning or in the evening, which is considered by many to be the best time to worship Lakshmi Mata. There is no need to keep a Fast but the practitioner should avoid non vegetarian food during the 49 days of this Mantra Sadhana. However, Hygiene and cleanliness are extremely important factors in any kind of Mantra Sadhana of Lakshmi. The practitioner should maintain physical hygiene and keep his home clean, while worshiping Lakshmi Mata. Ladies who are practicing this Lakshmi Mantra Sadhana should discontinue it during their Monthly Cycle and resume after the completion of the Cycle.